A long-term temporary traffic light at Interstate 80's exit 161 is helping ease football traffic backup. BELLEFONTE — Until the planned high speed Interstate 80/Interstate 99 interchange is completed, a long-term temporary traffic signal at I-80 westbound's exit 161 should help ease the back up of traffic that can occur as Penn State fans try to get to the game. There long has been a struggle on game day for motorists traveling from the east, cruising along until they got to the exit, only to run into a long backup on the interstate as a mass of cars tries to exit toward Penn State's campus and Beaver Stadium. Often, the backup would reach to the main highway, and stopped traffic trying to exit would be extremely close to cars flying by on the interstate. 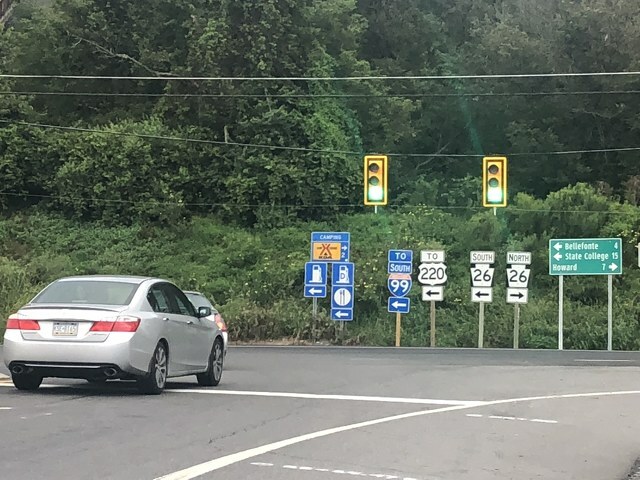 PennDOT community relations coordinator Marla Fannin said that the signal was a success during the first game, and helped keep the flow of traffic coming off Interstate 80 westbound safe during game day. Fannin said there was a slight back up on Route 26 heading east after the game, and she said PennDOT will continue to monitor the situation. With many construction projects happening around the county, PennDOT encouraged people to plan ahead as the travel for game day. “With the influx of traffic we encourage people to plan ahead and ‘know before they go,’ in order to best be prepared for their trip,” said Fannin. She said construction on Interstate 322 did provide some delays, as traffic between Decker Valley Road and Sand Mountain Road was limited to one lane in each direction. This will be an ongoing project throughout the winter and will affect traffic for all home games. PennDOT encourages drivers to “know before they go” and to check conditions on more than 40,000 roadway miles by visiting www.511PA.com. 511PA is free and available 24 hours a day. It provides traffic delay warnings, weather forecasts, traffic speed information and access to more than 860 traffic cameras.